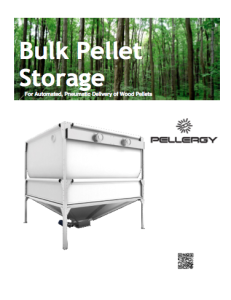 Since early 2009 Pellergy has been developing bulk wood pellet storage solutions that are cost-effective and easy to set up compared to other bin options. Our partner in providing bulk wood pellet storage solutions for the North American market is GEOplast. The GEOplast SPEED line of bulk pellet bins combine the best of technologies to meet the challenges of our local market. The height adjustable frame construction (between 71 and 98 inches) allows an optimum adjustment to the height of the room, even in low overhead basements with less than 6FT of height! The steel frame and base along with the plastic sides and top ensure a long life. They are moisture tolerant and well suited for use in basements. 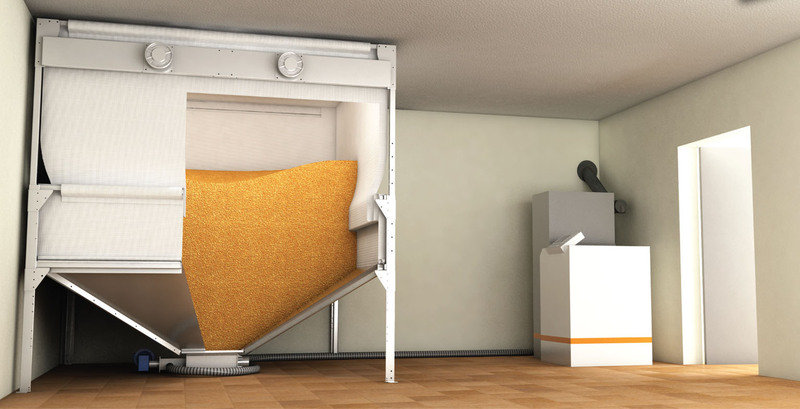 The cone-shaped design also ensures the complete emptying of the bin. The bins are compatible with the Pellergy Alpha boiler suction probes as well as the vacuum systems of many other pellet boiler manufacturers. Bulk Wood Pellet Storage in record time due to the innovative interconnecting cone sheets. No Screws, no bolts, no hassle. Optimum use of available space through the use of a height adjustable frame design. No need for a customized solution. They are available in a variety of sizes to suit almost any space. Find exact specifications for our fabric bins on our product sheet. Metal and/or flexible piping connect the bin to the fill port on the side of the building providing a seamless course from bulk wood pellet delivery truck to the bin. Because the bin is completely sealed, it requires both a fill and venting port to outside the building. Pellergy’s continuous dedication to innovation, testing, and product improvement is evident in our line of pellet storage bins. Follow our other Storage links to learn more about an option that will fit your requirements.